This week, I had the pleasure of interviewing Daisy Ozim, founder of Resilient Wellness, an innovative, cooperatively-owned healthcare system designed to address intergenerational trauma using holistic medicine, health education and technology. In this interview, Daisy discusses the racial inequities and deep competitive nature of the healthcare industry, and provides tips on how to triumph over the scarcity mentality. And, she shares how Resilient Wellness works as a cooperative to support health and wealth in her community. What made you passionate about starting a healthcare business? I used to work in public health policy. I recognized a lot of the root causes of chronic mental and physical illness were unresolved traumas. Also, my own lived experience of dealing with trauma has been a foundation of my passion for this work. Growing up in a marginalized community and a single parent household, I had a lot of adverse childhood experiences that set me up for some experiences in my adolescence and early adulthood that were not desirable. Because of the different traumas I experienced as a child, I was operating in a way that was not conducive to my growth. Luckily, I was introduced to programs and individuals who saw the greatness in me and brought me into different activities, workshops, and retreats. So, I was able to unpack that trauma and heal from it at an early age. Can you talk a bit about some of the organizations and individuals that supported you? Organizations such as One Life Institute, United Roots, and Youth Impact HUB, as well as various people of color and women have supported me in this journey. One Life Institute provided the space for me to reconnect with my fuller self and gave me the tools I needed for self-care, as well as a grounded community that I could come back to in times of crisis. United Roots is a safe space for young people to access resources, classes, and be in community groups to keep us out of trouble and help us thrive. And, Youth Impact HUB is how I started my social entrepreneurship. 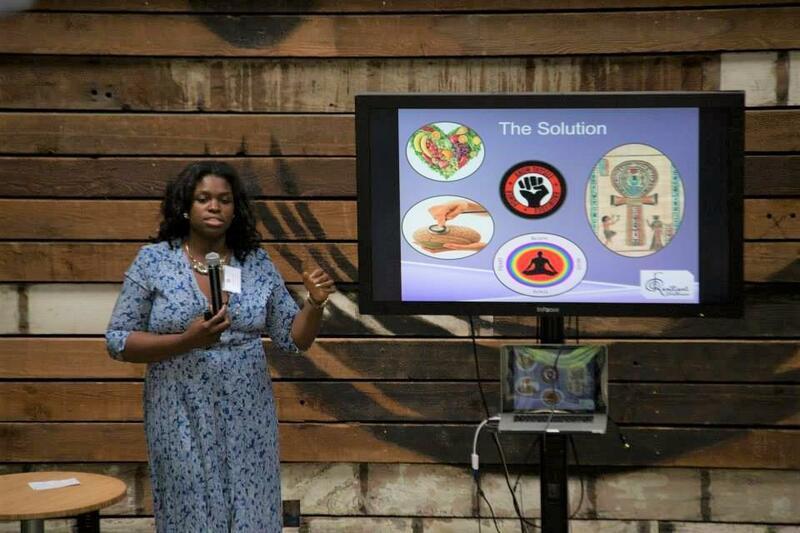 Before I got into Youth Impact HUB, Resilient Wellness was just an idea to teach. But Youth Impact HUB really helped me take it to the next level and gave me the tools and the confidence to understand that I could be an entrepreneur and have a successful business. What stage is Resilient Wellness in right now? We currently have a cooperative of people who provide healthcare services. We have health education, where we teach individuals and systems. And, we have a workforce development program for folks who want to go into holistic medicine or go into the healthcare field. We train them on issues in healthcare and do warm handoffs into certification programs and higher education. We also are working on technology and how we can use machine learning and data science to help healthcare systems improve their service delivery. How does the cooperative work? And, who are you looking to attract into the cooperative? People who want to join the cooperative agree to provide their services at a certain price. We take a portion of the provider fee to support the business’ operations, and at the end of the year, they get a portion of the business’ profits. As a result, they own a portion of the business. At the end of the day, the providers will get back more than they put in. We currently have about 20 cooperative members. By the end of the year, we’re looking at having at least 50 folks to expand our work. We’re looking for people who provide alternative healthcare services and are starting to branch out into Western medicine as we develop healthcare plans. If you’re a healthcare provider in any field with credentials in good standing, we’d love to have you on our team. Who does the cooperative provide services to? With the cooperative, we provide services to low income and historically marginalized communities. The individuals we work with have experienced high levels of trauma and chronic illness. They need those deeper alternative medicine services to heal their trauma but haven’t had access to them or haven’t had the information to understand the power of these techniques. Right now, we are working with 100+ individuals on a monthly basis. And in 2015-16, we served at least 1,000 individuals in the Bay Area and beyond. We traveled with our work to Florida, New York, D.C., Boston, and Ireland, and have done work virtually. What has been your greatest challenge in getting this business off the ground? There’s a lot of competition and commodification in the wellness space. When we come with the work we are doing, we are often perceived as competitive with work that’s already being done. It’s a scarcity mentality. We live in a capitalistic system that tells us that we have to compete with other people for resources, and accolades, accomplishments, and success are scarce. And also, when we might come from a space of lacking something – perhaps because we didn’t have resources or abundance growing up – we can have a deeply embedded scarcity mentality. So, people often perceive the work that Resilient Wellness is doing is going to be taking funds away from their organizations. Also, service providers, particularly people of color, sometimes wonder about who’s behind Resilient Wellness. Who are these folks? They often don’t understand that we’re also people of color trying to make sure that everyone has access to these services. So, it can be a challenge to get people to join the cooperative. They might feel like they’re going to lose their practice or sense of self if they offer services through the cooperative. This isn’t true because we ask everyone that joins to offer at least five to ten services a year in the cooperative so it gives space for everyone on the network to provide services at some point in time. Really, if we do this together, everyone can actually benefit and have a piece of the pie. How do you deal with this scarcity mentality? Honestly, it’s really hard. And, self-care is a must. It can make a person really cynical and jaded. But, I focus on putting out the intentions of integrity and showing up as my best self, letting people see me for who I am. Eventually, they’ll look within themselves and see where that mentality is coming from. And as time goes on, this is something that is going to diminish because people will see the sense of urgency and see that it’s going to be better for us to work together than apart. You’re also shifting the paradigm as a woman of color led healthcare organization. What has that experience been like for you? There’s a lot of racial inequity in this space. Especially around who’s able to get funding for wellness. There are people coming with the same old plan for providing services and are able to get funding easily versus a person of color who is coming in with something really innovative that can help their community. Sometimes, there’s a condescending viewpoint because of the type of work we’re doing. Like, who are you to be doing this type of wellness work? There can be a perception that wellness is only for certain types of people. Such as, why does someone who was formerly incarcerated need acupuncture or yoga? Also, there’s a real lack of understanding that a lot of these holistic practices came from people of color. Many of these practices and ideas are being taken and funded by venture, technology money. And the practices are being watered down, removing the healing element of these practices. Like, come to yoga to sweat or come to acupuncture because it sounds good. Or the models that look cool are taken and funded in a way that do more harm than good. How do you deal with these inequities? Again, taking self-care, building relationships and a network, and realizing what I’m dealing with is really powerful. Because we can think that it has something to do with us, when it really has nothing to do with us at all. It’s just where people are at mentally. And, it’s important for us to continue to do the work and continue to be innovative. The innovation will set us apart from people who are doing this for their own benefit and gain. What’s next for Resilient Wellness? Resilient Wellness is looking to open our first community health center, where we can offer our services, classes, and events. This will help us move toward being able to offer community health plans, so people who don’t have insurance or who are going to be losing their insurance because of policy changes, have something to fall back on. We have a really great commercial landlord and were able to lock in a good price for a three-year lease, even longer if possible. We’ve been working on funding for the space. We raised $10,000 through a Kiva crowdlending campaign within 3 days last week, thanks to matching funds from Google. That allows us to get into the space. Now we’re raising $10,000 more through GoFundMe donation-based crowdfunding to get supplies for the clinic. What advice do you have for someone who is starting a business? If you have a dream for a business, really go for it. Because you might see someone else doing it, and you’re going to be upset. Go through Uptima Business Bootcamp. Seriously, this is not like an advertisement. You really need a space to organize your thoughts, organize your business, or else you can really just get blown away by the wind. Because new entrepreneurs can be really idealistic and naive with their business goals, they can end up not getting anywhere with it and getting really disheartened. I got disheartened about the legal process, building team, and getting funding because those are all things that are not my skillset. I’m more like a visionary. But going through the accelerator and getting my thoughts and my business organized gave me the confidence that I needed to know that I can get this done. Getting my business organized was really the best thing I could have done for myself and my enterprise. Also, be careful who you share your ideas with and your social and intellectual capital because people are really looking for the next great thing to jump on and get funded and become famous. Lastly, find a good group of people who you know believe in your mission or cause to support you and help you. Learn how you can benefit from health and wellness services or become a cooperative member at Resilient Wellness by visiting their website. Or, support Resilient Wellness in opening their first community health clinic by donating through GoFundMe.